The European Commission has today published the preliminary results of the public consultation on clock change in Europe. This online consultation, which ran from 4 July to 16 August 2018, received 4.6 million responses from all 28 Member States, the highest number of responses ever received in any Commission public consultation. According to the preliminary results (see annex), 84% of respondents are in favour of putting an end to the bi-annual clock change. The preliminary results also indicate that more than three quarters (76%) of the respondents consider that changing the clock twice a year is a ‘very negative’ or ‘negative’ experience. Considerations related to the negative health impacts, increase of road accidents or the lack of energy savings, were put forward by respondents as motivations to put an end to the change. European Commission President Juncker put the summertime question on the political agenda as part of his pledge to be big on the big things while leaving it to Member States to take decisions where they are best placed to do so. 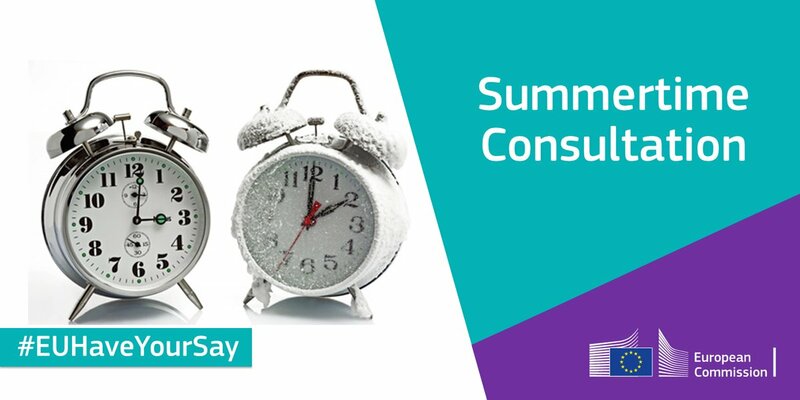 The public consultation on clock change arrangements was organised by the European Commission as part of its ongoing assessment of the current arrangements on clock change in Europe. It also follows the European Parliament’s resolution in February 2018, as well as requests from Member States, stakeholders and citizens.